With an ideal location in an unspoilt town, this hotel has a commanding panoramic view of the beach and Cornwall's Atlantic heritage coast. 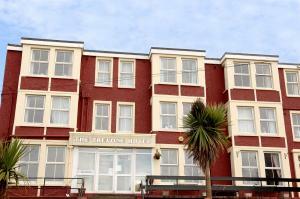 The hotel is in the centre of a Victorian crescent overlooking Summerleaze Beach. It has a warm, welcoming atmosphere and offers a comfortable, tranquil base from which to enjoy one of the most spectacular stretches of coastline in Britain. Enjoy the friendly, relaxed environment and high standards of service, comfort and cleanliness. Situated in the quaint Cornish village of Menheniot, this former circa 17th century coaching inn offers en suite accommodation and a traditional atmosphere. Within easy reach of numerous local attractions, The White Hart offers 7 rooms, where you can relax with a tea or coffee in front of the television. A hearty full English breakfast is provided every morning, whilst an ? la carte menu is offered every evening from 19:00, with a number of homemade specialities. Relax with a real ale in the lounge and public bar areas, amid traditional slate floors and beamed ceilings. A beer garden is also available for when the weather is fine. A large public car park adjoins the property. In 4 acres of beautiful grounds, this 3-star (AA) hotel is rated amongst the top 20 hotels in Cornwall and has an AA Rosette award for food excellence. The Trelaske Hotel freshly prepares meals using locally sourced seasonal produce. Fresh fish and shellfish come from the Cornish fishing port of Looe. Meat is sourced from award-winning Cornish farms. Much of the fruit, vegetables and herbs are from the hotel's own grounds. With just 7 rooms, guests receive attentive, individual service. All of the spacious, comfortable rooms have lovely views over the surrounding countryside. Free private parking is available on site and there is also a cosy bar and comfortable lounges with real open fireplaces. Perfectly situated, Bay Retreat Villas is set within the St Merryn Holiday Village on the outskirts of St Merryn, just 3 miles from Padstow and close to many spectacular bays. Each stylish 4-star villa has 1 twin room and 1 double room, with balcony. Features include a kitchen, a lounge/dining area, a private timber decked terrace and a small garden. Contemporary facilities include a flat-screen satellite TV and DVD player. The well equipped kitchen boasts a microwave, dishwasher, fridge, freezer, washing machine, oven and hob. On-site amenities include a bar, an Indian restaurant and use of the tennis courts. 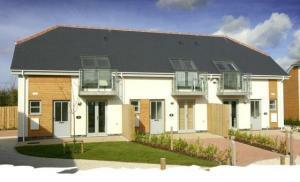 There are shops, pubs and restaurants in picturesque St Merryn, which is 1 mile from the villas. One of the few Padstow hotels with free parking, the 4-star Metropole mixes Victorian and modern styles. There is an AA Rosette restaurant and superb views of the town and Camel Estuary. The Metropole hotel has 2 comfortable lounges and the Met Caf? Bar (open until 21:00), with an outdoor decked area. Quality local ingredients are used to create traditional, Asian and Mediterranean dishes. Breakfast options include kippers and smoked haddock. Expect a good choice of wine, including those from the nearby award-winning Camel Valley vineyard. 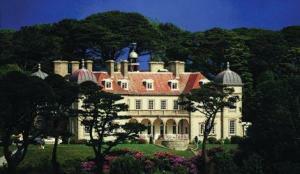 The restaurants of famous chef Rick Stein are within easy reach. The Metropole's gardens are well-tended and filled with many interesting plants. The outdoor swimming pool is open during July and August. Falmouth's leading 4-star hotel occupies an unrivalled seafront setting, just metres from sandy beaches and the town centre. Terrace Restaurant has magnificent sea views and 2 AA Rosettes for its fine cuisine. 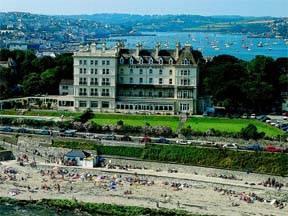 The gardens and sun terrace at The Royal Duchy Hotel overlook the famous Falmouth Bay and its boating activity. An indoor pool, sauna and treatment room add to the luxurious finishing touches. The Royal Duchy boasts a newly decorated sumptuous bar and lounge in addition to a snooker room and each beautifully furnished en suite bedroom. 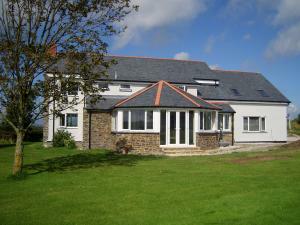 Whiteways has a central position in Penzance, 2 minutes' walk from the harbour and town centre. The guest house has good-value accommodation 50 metres from the coach and railway stations, and close to the local beach and promenade. St Michaels Mount, Newlyn, Mousehole, Minack Theatre at Porthcurno, Lands End, St Ives and Flambards Theme Park are within a 10-mile radius of the Whiteways. Situated in the heart of the Fowey Valley, Restormel Lodge Hotel is a secluded and peaceful spot in a busy resort. 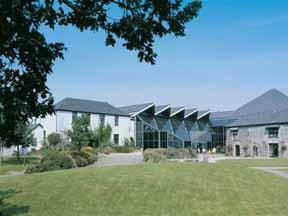 Restormel Lodge is located on the A390, and just 6 miles (9.6 km) from the Eden Project. The hotel offers modern comforts and traditional hospitality. The friendly restaurant has seasonal menus offering Cornish produce, and a well-stocked wine cellar. The area has many little fishing villages. Other local beaches and beauty spots include Carlyon Bay, Par and Polkerris. 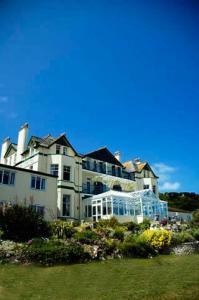 The Falmouth Hotel is the most enduring hotel in the popular maritime resort of Falmouth. We offer a full range of amenities and facilities for you to enjoy. The Falmouth Hotel is set in five acres of beautifully landscaped gardens and enjoys a prime location on the seafront, opposite a sandy beach. 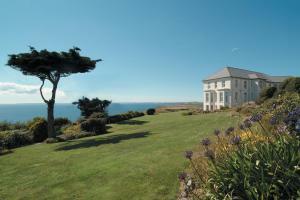 The chateau-like structure is further enhanced by views over Pendennis Castle, the headland, harbour and out to infinite sea. The Falmouth offers 69 individually appointed bedrooms, most of which enjoy wonderful sea, harbour or garden views; along with a selection of self catering apartments and cottages. The hotel is fast becoming known for the high quality of its food, created by the Head Chef who is a much respected by his peers. Good dining is a prerequisite in a hotel: this is The Falmouth's philosophy when it comes to food. Every effort is made to source local delicious quality produce and with it, create dishes that appeal to all appetites - from gourmet to plain and simple. Occupying a dramatic waterfront location, with direct access to its own Blue Flag accredited beach, this family-run hotel boasts a splendid setting and spectacular sea views. 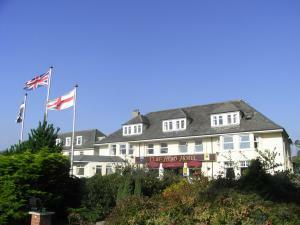 The hotel is situated above the 25 acres of golden sands of Carbis Bay Beach, part of the larger St Ives Bay. It is one of only 2 bays in the United Kingdom to qualify as a member of the exclusive, internationally recognised Most Beautiful Bays in the World organisation. Steeped in over 100 years of tradition and history, the Carbis Bay Hotel aims to provide a high standard of service complemented by courteous and friendly staff, and attention to detail. Close to the railway station, in the very heart of Cornwall, this guest house is within easy reach of many of the region's beaches and places of interest. In the port of Falmouth, close to the town centre and Woodlane Art College campus, Lyonesse Guest House offers a range of accommodation to suit the needs and budget of any traveller. Some rooms have en suite bathrooms and rooms without en suite bathrooms are also available. 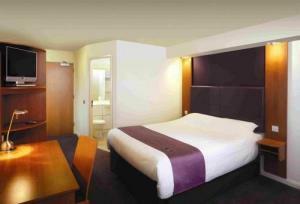 All rooms have TVs and tea/coffee making facilities. Free Wi-Fi wireless internet access is available throughout. There is a lounge for guests' use with books, games and newspapers. All guests receive a complimentary guest membership for the sports club across the road, which offers tennis, squash, table tennis, a gym and a bar. Breakfast is included in the price and features locally sourced produce, including free-range eggs. Vegetarian and vegan breakfasts are available on request. Family-run, the Lyonesse takes great pride in its relaxed, friendly atmosphere. 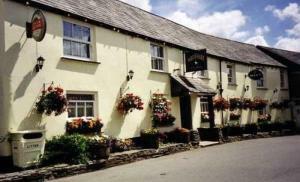 The Slipway Hotel dates back to 1527 and is opposite the fishing harbour in picturesque Port Isaac. It has a seafood restaurant and the bar serves local ales and ciders. Diners may eat in the galleried seafood restaurant or outside on the terrace. Menus focus on fresh local fish and seafood. All 10 en suite bedrooms are stylishly furnished to a high standard, and many have sea views. They are elegant, simple and contain all the facilities you should need. This informal, friendly, non-smoking, family-run hotel with sea views is a 2 minute walk from Newquay town centre and surfing beaches, and is close to golf courses and fishing lakes. The hotel is the ideal base for exploring Newquay and Cornwall, with the Eden Project just 15 miles away. 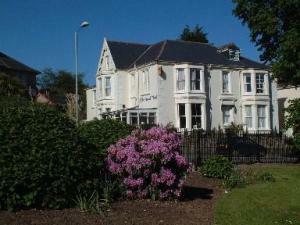 The hotel is a 3 minute walk from the train station and a 10 minute drive from Newquay Airport. The hotel can arrange surfing lessons; they will pick you up, arrange for your wetsuit, and drop you back to the hotel. Fishing trips can also be arranged. Group and team parties are accepted (with prior notice only), except in August. With superb sea views, comfortable en suite rooms and a stylish modern bar, the Carnmarth Hotel looks out to sea over Fistral Beach, one of the most famous beaches in the UK. With a fantastic location, close to the heart of Newquay's town centre and within easy reach of the area's best beaches, the Carnmarth Hotel offers something for everyone all year round. All rooms have open views of the sea or headland and each well-appointed room has controllable heating, a hairdryer, tea/coffee making facilities and an LCD flat-screen TV with Freeview digital channels. Every room has an en suite shower room. The stylish and comfortable C-bar oozes sophisticated beach chic. With a south-facing terrace, you can relax and watch the sun set over the Atlantic. With an on-site surf school, you can spend a few hours learning to surf or just enjoy a walk along the coastal paths. Nestled amid 12 acres of rolling countryside in Helston, this private-owned hotel boasts comfortable accommodation and welcoming communal areas with spectacular views over Polurrian Beach. Since being purchased by the Barlow family in 2005, the Polurrian Hotel has undergone extensive refurbishment and restoration to provide 3 comfortable lounges, a snooker room, 39 newly refurbished bedrooms, a dining room and the 'High Point' terrace restaurant, which remains open all day. The public rooms and most of the bedrooms enjoy wonderful views of the surroundings. In the gardens, the sun terraces and tennis court overlook Polurrian Beach, whilst the small, walled gardens provide a sheltered spot for relaxation.